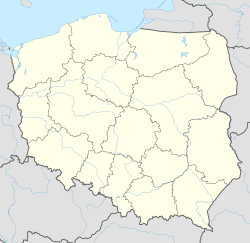 Wólka Wojcieszkowska [ˈvulka vɔi̯t͡ɕeʂˈkɔfska] is a village in the administrative district of Gmina Sieciechów, within Kozienice County, Masovian Voivodeship, in east-central Poland. It lies approximately 6 kilometres (4 mi) east of Sieciechów, 19 km (12 mi) east of Kozienice, and 95 km (59 mi) south-east of Warsaw. Wikimedia Commons has media related to Gmina Sieciechów. This page was last edited on 21 March 2017, at 17:58 (UTC).